2 0 1 5 S E P T E M B E R P R I N T W E A R || 89 er-quality stones may help keep overhead costs down, but it also increases the poten- tial to drive patrons away if they find you are providing a substandard product. There are many options available on the market from less expensive, lower-grade stones, to expensive high-grade Swarovski and Precosia crystals. Regardless of the cal- iber of stone you purchase, it's important to look for stones with a consistent size and shape. Also, make sure to find stones that contain a scant amount of lead. All rhinestones will have an inherent amount of lead within them, but after recent in- vestigations and the potential health risks involved with lead, customers will value a health conscious stone. GETTING STARTED Custom patterns and templates for rhine- stone and vinyl decals can be achieved through various methods, and it is now made easier with affordable cutters, heat presses, and software. In the case of starting a business, or po- tentially adding rhinestones to a preexisting decal business, small- to mid-sized pattern cutters are available. Shop for machines that have the ability to plug into an exist- ing USB port so that it can easily link to graphic design software to expertly cut designs into rhinestone template material. Once these designs are cut, rhinestones can be brushed into the pattern and readied for a hotfix transfer. A mid-range vinyl cutter is a wise investment for businesses that want to quickly produce more product. The mid- range cutting machines have larger cutting widths, which will be advantageous in cut- ting bigger sheets of vinyl and template ma- terial. For a business cutting multiple tem- plates, a large cutting width helps reduce production time and eliminates the task of first having to cut down a 20" sheet of template material to feed into a small cutter. Instead, an entire sheet can be fed through for quick cutting and production. With stronger servo motors and larger cutting areas, these larger production cutters will produce accurate quick cuts, and decrease production cost and time. Evaluating the needs of the business is es- sential when shopping for a cutter. But, up- grading from a personal cutter to a piece of equipment with stronger servo motors will make for faster, more accurate, professional cuts to any number of materials. A heat press is also a necessary rhinestone purchase. In fact, this machine may be the most valuable necessity for the future er-quality stones may help keep overhead costs down, but it also increases the poten- tial to drive patrons away if they find you graphic design software to expertly cut designs into rhinestone template material. 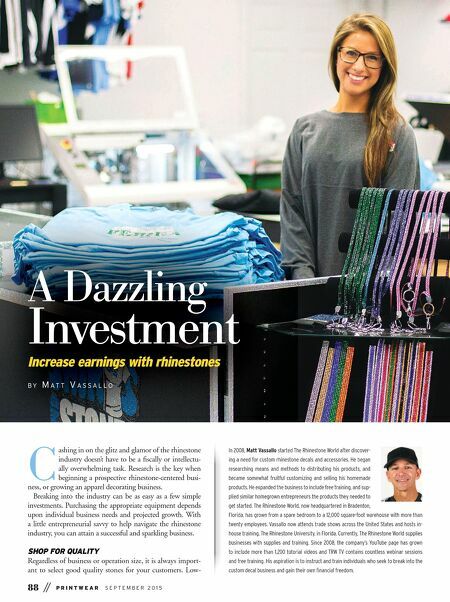 Once these designs are cut, rhinestones can Rhinestones can be adhered to practically any type of apparel. They can also be used on accessories to expand opportunities. (All images courtesy The Rhinestone World) Custom Rhinestone Heat Transfers by CustomRhinestoneShirt.com 281.259.6818 or 832 .489.8229 Spangle transfers 2/3 day turnaround in USA THINGS ARE HEATING UP AT XPRESSCREEN! 800-597-9530 www.xpresscreen.com info@xpresscreen.com The red hot GOCCOPRO QS200 is on fire with its thermal technology and eco- friendly design. Compact and easy to use, the QS200 has revolutionized the screen printing world. 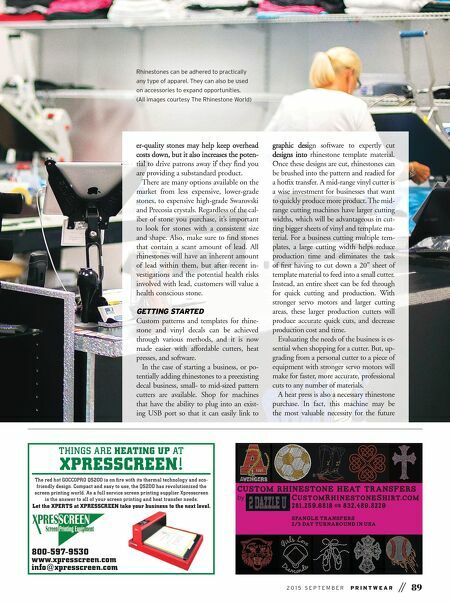 As a full service screen printing supplier Xpresscreen is the answer to all of your screen printing and heat transfer needs. Let the XPERTS at XPRESSCREEN take your business to the next level.